Carl Downard from Boise swept the first day of the Super Shifter class at the Stinker Season Opener at Firebird Raceway. Having raced at Firebird since it first opened in 1968, the 73 year old Downard stopped reigning track champion Glen Phillips from Middleton. 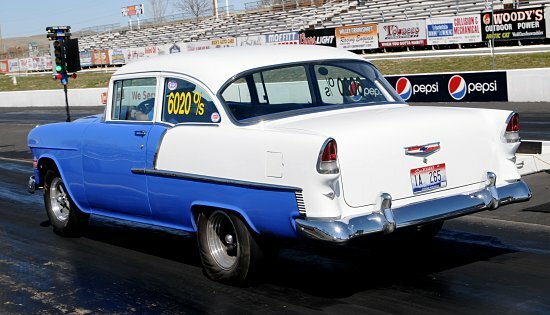 Driving his stick shift `55 Chevy, Downard won the division with a 14.42 seconds run at 86.28 miles per hour. In the kickoff round point’s event in the Boise Muffler Gold Cup Series, Troy Thomas, Chad Campbell, Rex Petersen, and Chase Bittick took the early lead in each of their respective categories. In addition, Wes Morris won his third race in-a-row in the Junior Dragster class. Troy Thomas, Meridian, .024, 8.26 (8.22 dial) 155.44 def. Rayce Kidd, Twin Falls, .033, 7.73 (7.69 dial) 166.38. Chad Campbell, Meridian, .026, 10.27 (10.27 dial) 120.77 def. John Lindbloom, Eagle, .103, 9.41 (9.43 dial) 142.87. Rex Petersen, Boise, .120, 12.94 (12.89 dial) 106.64 def. Tyler Rush, Boise, -.003 foul, 18.33 (13.29 dial) 50.57. Chase Bittick, Caldwell, .133, 10.69 (10.62 dial) 118.98 def. Rich Pedraza, Boise, .195, 9.89 (9.87 dial) 126.61. Carl Downard, Boise, .252, 14.42 (14.32 dial) 86.28 def. Glen Phillips, Middleton, .031, 13.30 (12.61 dial) 107.43. Carl Youngstrom, Caldwell, .077, 12.29 (12.27 dial) 107.90 def. Marcia Randall, Emmett, -.012 foul, 11.16 (11.16 dial) 120.22. Dan Hurlbert, Eagle, .074, 12.17 (12.16 dial) 110.66 def. David Meimann, Middleton, -.020 foul, 14.25 (14.26 dial) 98.61. David Kletzien, Boise, .023, 9.49 (9.46 dial) 135.66 def. Liz Micheletty, Kuna, .155, 10.18 (10.22 dial) 139.81. Ashton Davis, Middleton, .082, 17.74 (17.68 dial) 78.37 def. Justin Partlow, Middleton, .339, 14.22 (14.45 dial) 87.71.